The return address was from security@facebook.com, they knew my first name, the English was proper, the message made sense, and the link they wanted me to click was legitimate, https://www.facebook.com/login/. I certainly didn’t try to login to Facebook at 3:24AM using the Firefox browser on Windows 8, because my default browser is Google Chrome on Mac OS X. 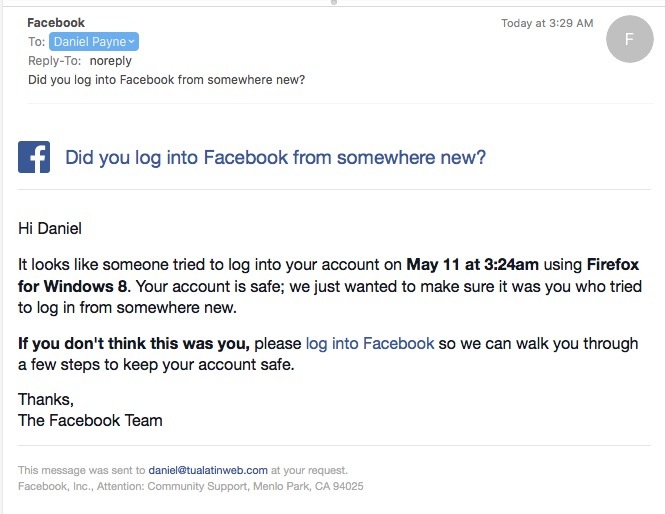 The security folks at Facebook automatically noticed that someone was trying to login to my account from South Korea, which they blocked, and then for added security Facebook locked my account until I could respond to their email request to login and answer questions about my login history. I feel protected by Facebook and am quite happy to reset my password and continue using Facebook today. I did quickly look at my Facebook feed to double check that nothing had been posted as me by another person, and found the feed to be all safe. What a happy ending to the story.